What essensys Operate Triggers and Actions are Supported? Deleted Contact - Triggers when a contact is deleted. New Lead - Triggers when new lead is created. Updated Lead - Triggers when a new lead is updated. New Calendar Event - Triggers when a new calendar event is created. Deleted Calendar Event - Triggers when a Calendar Event is deleted. Create Account - Creates a new account. Create Tour - Creates a new Tour. Create Charge Sheet - Creates a new charge sheet. 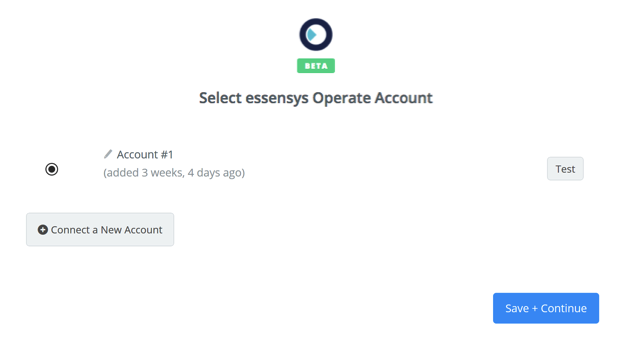 How to Get Started with essensys (Operate) on Zapier? 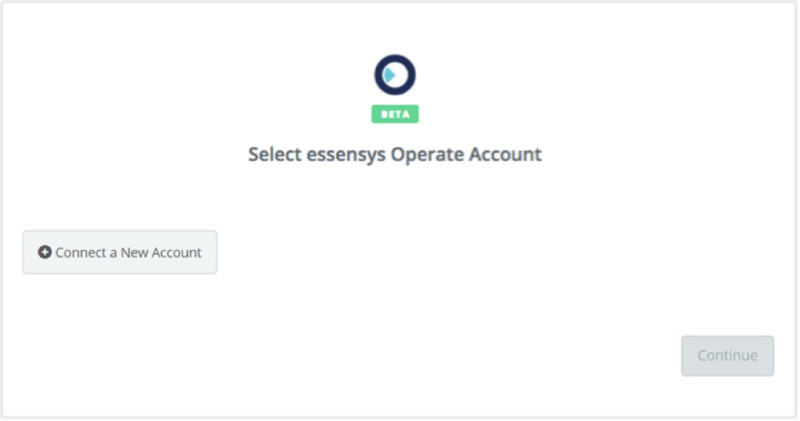 To get started integrating Zapier with the essensys Platform, you need to connect the two systems first. Once you have signed up for Zapier, you will need to search for essensys (Operate). You do not need to go through any other configuration to make essensys (Operate) work with Zapier. 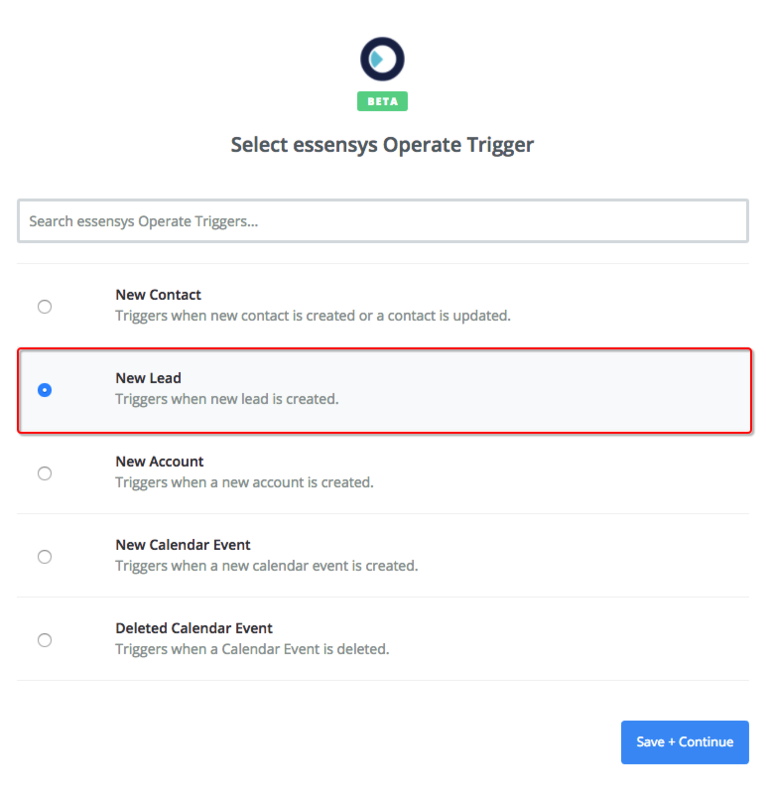 The triggers and fields supported by essensys (Operate) are registered with Zapier and will be available when you create your zaps. 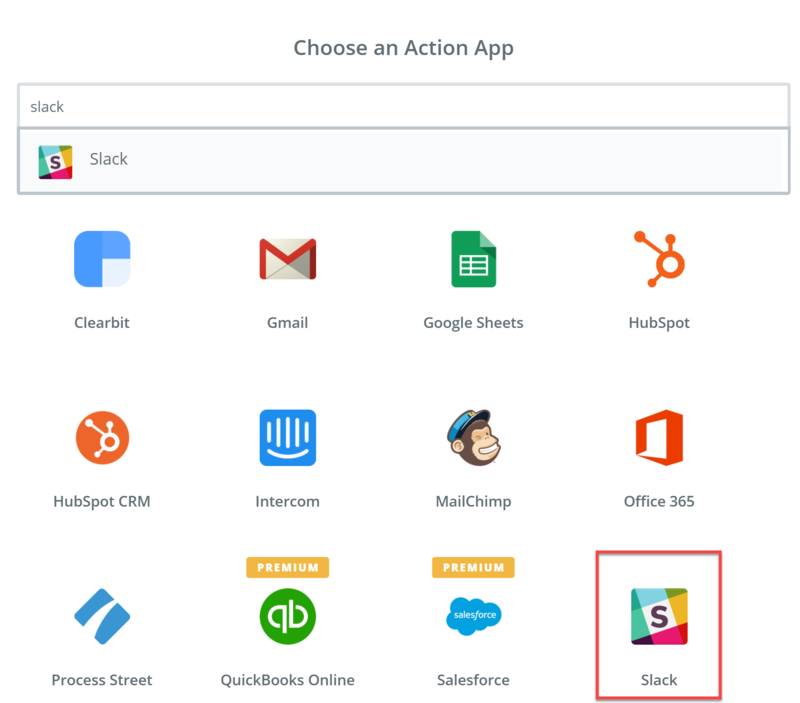 For any apps you want to integrate with essensys (Operate), those apps will need to have the necessary triggers and fields registered with Zapier. You will be able to see what fields and triggers are registered when you add their app to your zap. You may want to add a Filter to your triggers. This will allow you to add more conditions around what events will trigger your zap. essensys (Operate) can be both the trigger and the action app. Below we will show you how to create your first zap using essensys (Operate) as a trigger app. 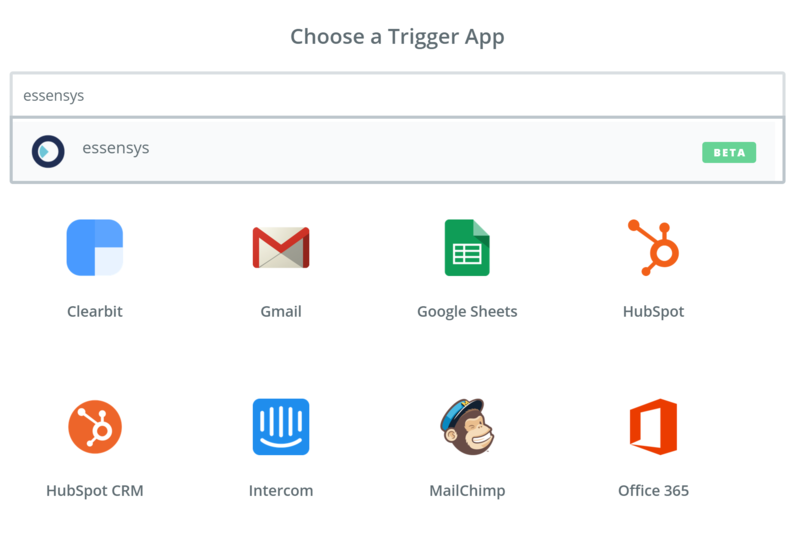 As soon as you have added essensys (Operate) to your Zapier, you will need to select a trigger. In order for your zap to work, you need to log into your essensys account. Please click Connect a New Account. Next, log in with your essensys (Operate) credentials. You will then be able to select this account every time you create a zap. Click Save + Continue when you are ready. Next, perform the task that represents your trigger on essensys (Operate). 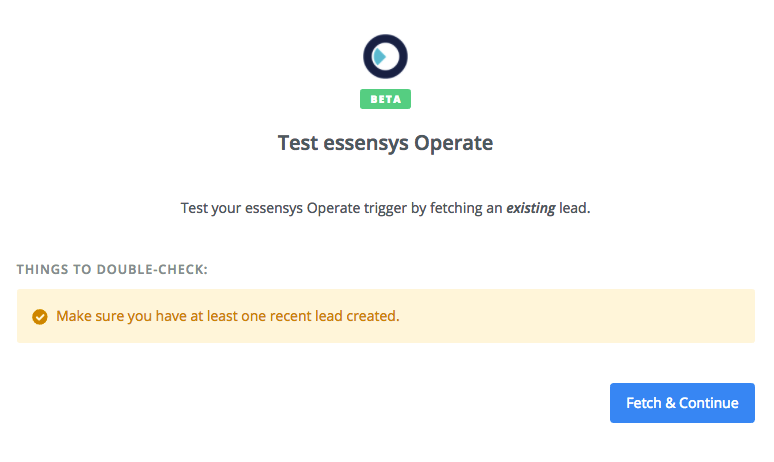 For example, if your trigger is "Lead Created", then you will need to create a lead in essensys (Operate) in order to test the trigger. Note: This step will differ depending on the trigger you select for essensys (Operate). For example, if you were to select 'Calendar Created' then you would need to create a test booking instead of sending a lead. Click Connect & Continue when you are ready. You have the possibility to skip the test and continue; however we recommend testing, to make sure your zap runs smoothly. As soon as your test is completed, you will see a screen that shows whether it has been successful or not. You will have the possibility to retest, no matter the result of the initial one. If it fails, Zapier will show you why. Correcting the reported issues should allow the test to go through. Zapier will now ask you to also select an action app, the same way you've selected the trigger app. 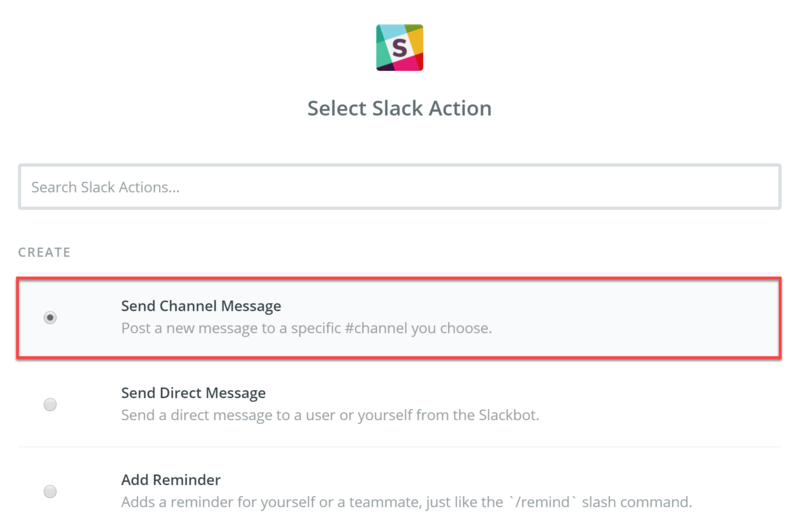 We will be using Slack as an example. This step determines what action the zap will take when your trigger occurs. Now select an action app account or connect to one if you haven't done so already. If you will connect to a new account, you will be asked to log in. 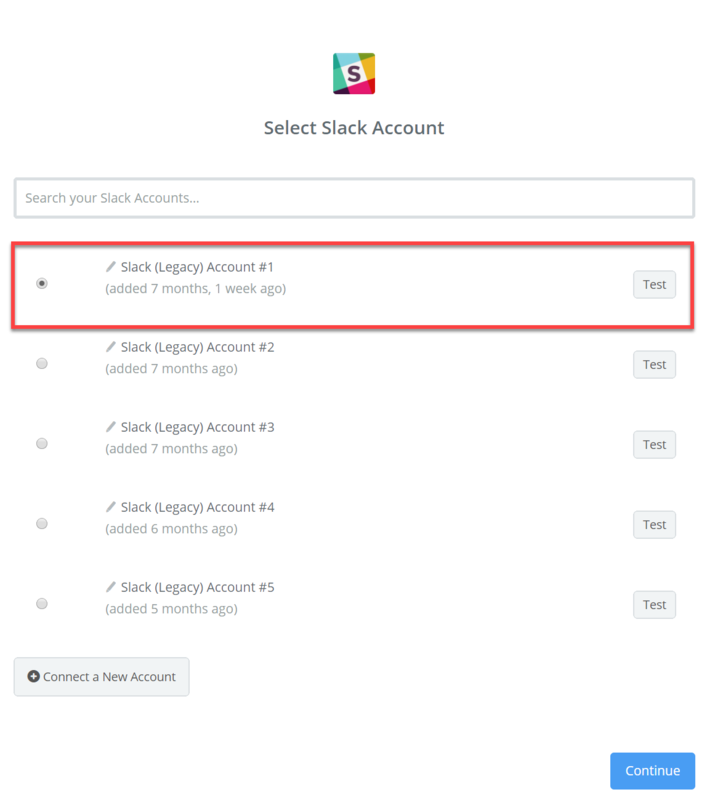 For example, if you are integrating essensys (Operate) to Slack, you will need to log into Slack. Once your account is selected, click Continue to proceed. Here is where you can configure different options for your action. This step will involve different configurations, depending on your selected action app. Zapier will now perform a test action using the app you have selected.